A quick rundown of steps to take to ensure a successful semester. Congratulations, welcome to Nanook Nation! Here’s what you need to know to get started. If you need help, email us at uaf-ecampus@alaska.edu, call 907-455-2060 or fill out this form for assistance. The University of Alaska uses single sign-on, meaning you’ll need to set up one username and password that will work on all UA systems (email, Blackboard, etc.). To create your account, go to https://elmo.alaska.edu/. Your advisor will help guide you through your academic journey. You’ll need to meet with them at least once a semester to go over your courses for the upcoming semester. Don’t know who your advisor is? We’ll help connect you to the right person. After your courses have been approved by your advisor, go to UAOnline to register. File your FAFSA at fafsa.gov and apply for university scholarships. We use a common scholarship application, meaning you could be eligible for hundreds of scholarships by submitting just one application. These tasks should be checked off your list before the first day of class. Go to Blackboard (classes.alaska.edu) to ensure your password is current. If you are having difficulty logging in, consider resetting your password at elmo.alaska.edu or call the OIT Help Desk at 907-450-8300. Navigate through Blackboard to get ready for your course content (which will be loaded by the first day of instruction). You should also take the Blackboard Student Success Lab located in the eCampus tab at the top of your Blackboard menu. 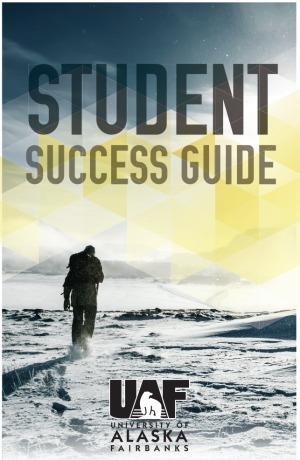 Read through the short Student Success Guide, which has tips for starting your courses on the right foot and an extensive list of resources you can refer to throughout the semester. You can order your books online at uaf.edu/bookstore or through another college textbook vendor. Be sure to order the correct ISBN in time for arrival by the first day of instruction. UAF primarily uses your UA email address (@alaska.edu) to communicate with you. If you do not plan on using your UA email it is important you have it forwarded to an address you check regularly. To forward your UA mail simply go to the “Settings,” in your email then “Forwarding and POP/IMAP.” Then select “Forward a Copy of Incoming Mail to” and enter your preferred email address. Don’t forget to save your changes! If you need to contact your instructor, go to people.alaska.edu to search for their email, phone number or office location. If you’re unable to locate your instructor’s information, contact UAF eCampus at uaf-ecampus@alaska.edu or 907-455-2060 for assistance. You can find the deadlines for paying tuition and fees on the UAF Academic Calendar. To pay your balance, log in to UAOnline and go to “Student Accounts” or call 907-474-7384. To avoid late fees, you must pay on time or set up a payment plan. During fall and spring semesters, the university initiates “Drop for Non-Payment” so if you fail to pay by the deadline you may be dropped from your course. If you haven’t yet paid your balance in full make sure you do so before the deadline. You can find the deadlines for paying tuition and fees on the UAF Academic Calendar. To pay your balance, log in to UAOnline and go to “Student Accounts” or call 907-474-7384. Online courses do not require meeting times, however, students will have assignments each week. Many instructors require you to submit an introductory assignment during the first week of class. Be sure to complete these so you don’t get dropped from course. Some eCampus courses require proctored (supervised) exams. Your syllabus will let you know if any of your exams have to be proctored. If you are in the Fairbanks region, you must take your proctored exams at UAF eCampus. If you are not located in the Fairbanks area, you will have to arrange a local proctor. Learn more about the process for taking proctored exams. Your midterm grades will be available at UAOnline. Progress reports contain grade feedback through the mid part of the semester. Use this feedback to determine if you need to adjust your coursework or possibly make up missed assignments. Now is a good time to make sure you are on the right track to be successful in the course. It’s recommended to map out your degree plan and enroll in courses early to make sure you stay on track toward your graduation goals. File your FAFSA at fafsa.gov every year. Then apply for university scholarships and other financial aid before February 15th each year! Contact your advisor early to strategically plan your courses for upcoming semesters to ensure a timely graduation. Not sure who your advisor is? Find them on this list or contact the UAF eCampus advisor for help. The longer it takes you to graduate the more money it will cost! You can review your progress any time in DegreeWorks, which you can find in your UAOnline account. Explore next semester’s eCampus courses. Students enrolled in UAF degree programs must contact their advisor before registering every semester — until then you will have a hold on your account and will not be able to add classes in UAOnline! Not sure who your advisor is? Find them on this list or contact the UAF eCampus advisor for help. Online courses are very popular and often fill up quickly. Current eCampus students can use UAOnline to register for courses. Other students can use the eCampus registration form. UAA and UAS degree-seeking students registering for UAF courses may be blocked because of prerequisite errors. The current registration system does not automatically recognize credits from UAA or UAS at UAF. Contact our Registration Coordinator by emailing uaf-ecampus-registration@alaska.edu or calling 907-455-2060 for assistance.